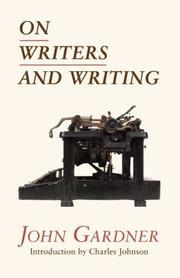 By the time he died in a motorcycle crash in 1982, novelist John Gardner had distinguished himself as a candid, thoughtful critic of his fellow fiction writers who wasn't embarrassed to write a manifesto, On Moral Fiction (1978), that argued against purely aesthetic, formal judgments of literature. In this collection of essays and reviews, he addresses specific writers and books -- e.g., John Cheever's Falconer, William Styron's Sophie's Choice, even Lewis Carroll's Alice in Wonderland -- as well as the generic problems, joys, and issues involved in the writing of fiction. Even when critical, Gardner gives his objections a contrarian twist, finding that William Gaddis' JR is not, as the common wisdom has it, an "awesomely unreadable" but intellectually majestic novel. Instead, he argues that JR is "wonderfully and easily readable," but that in the end it is intellectually and morally lazy, concluding: "It pays, of course, that scornful sneer; people love to be told everything stinks. It sounds so intelligent.